I see there are various tweets with the same Virginia Code Brandi, Karma and I posted here.... Inquiring minds wanted to know. Thanks, Muffy Bee and Brandi. I'm still confused - a normal state, though. Why in the world would a person walk into the police station, if he was guilty of something, and ask for a lawyer? Or maybe I'm misremembering things. I feel like sometimes we don't get correct story either because of journalists misunderstanding or misreporting or those being interviewed purposely/accidentally misspoke. Could it be that Jesse Matthew was requested by investigators to come into the station for questioning? He complied but had no intention of answering any questions without an attorney. When Jesse was put in contact with an attorney ... he was instructed to remain silent. Charlottesville police have obtain an arrest warrant charging Jesse L. Matthew with abduction with intent to defile, a felony. Charlottesville police chief Tim Longo says that Tuesday afternoon investigators determined they had enough probable cause to seek the warrant. He did not provide any details about what evidence they have that could support the charge but he called it a serious charge. Police are now looking for both Graham and Matthew, who has not been seen since the weekend. Matthew also faces charges of reckless driving. That makes sense.. Thanks for thinking it out. Longo said police, who have searched Matthew’s car once and his apartment twice, decided they had probable cause to charge him in Graham’s disappearance. He declined to say what new information police had, and he did not take questions. Officials said earlier that they took clothing during their second search of Matthew’s apartment Monday, but they would not elaborate on the importance of the items. Police first searched the apartment Monday, and police Capt. Gary Pleasants said information that came up during the investigation led to a second search. He would not give details about the clothing or elaborate on the search. As of Tuesday afternoon, the state lab was still analyzing evidence it has received from the Charlottesville Police Department, which included nearly two dozen items and eight “known samples that we would use for comparison purposes,” said Jeffrey Ban, director of the Department of Forensic Science’s Central Laboratory in Richmond. Ban said that the department has expedited the case and hoped to provide authorities with results in the “very near future.” But he noted the lab could spend hours or even a whole day on a single piece of evidence that may have multiple stains or hairs on it. He also said it is standard procedure to test any samples against those in their database, including those from other missing persons cases in the central Virginia area. Matthew is a patient technician in the operating room at the university’s medical center. 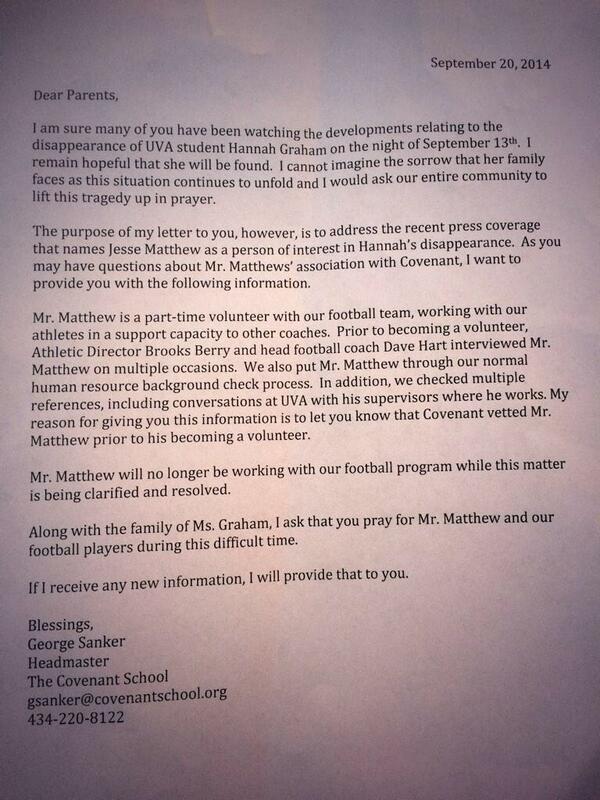 Police have not offered any details about how he and Graham, a sophomore from northern Virginia, may be connected. Authorities on Tuesday released an updated wanted poster reflecting the new charge against Matthew. It says the 6-foot-2, 270-pound man was last reported driving his sister’s 1997 light blue Nissan Sentra, and notes that he is said to have contacts in Virginia, Maryland, New York, Pennsylvania and Washington, D.C.
Police said they have focused on Graham’s movements the night of Sept. 12 and into early Sept. 13. Grahammet friends at a restaurant for dinner, stopped by two parties at off-campus housing units and left the second party alone, police have said. According to family members and police, Graham is an alpine skier and plays the alto saxophone. Organizers of a candlelight vigil last week at the university handed out her favorite candy, Starburst. Longo said he learned from visiting with Graham’s parents that the graduate of West Potomac High School earned straight A’s six years in a row. The suspect in the case of missing University of Virginia student Hannah Graham has been charged with abduction with intent to defile, police said Tuesday. Charlottesville Police Chief Timothy Longo said in a brief evening press conference that an arrest warrant has been issued for Jesse Leroy Matthew Jr., who police believe was the last person seen with the 18-year-old student before she vanished Sept. 13. “We absolutely are continuing our search for Hannah," Longo said. Longo did not specify what specific evidence authorities found that lead to the charge. On Saturday, Matthew, 32, stopped by the Charlottesville police station with several family members and asked for a lawyer, Charlottesville Police Chief Timothy Longo said. Matthew was provided with an attorney, but left the station after about one hour without offering any information to police. He then went to his grandmother’s house and was seen by officers driving from the home at a high rate of speed, which endangered others and led to the reckless driving charges, according to the police chief. Virginia State Police officers were conducting surveillance of the vehicle at the time but did not pursue Matthew, a spokeswoman said. "He has not been seen, that we know of, since Sunday, and we have not heard from him or had any communication of his whereabouts," Capt. Gary Pleasants told "Fox & Friends" on Tuesday. CHARLOTTESVILLE, Va. — Charlottesville Police announced that Jesse Leroy Matthew Jr. is now wanted for abduction with intent to defile Hannah Elizabeth Graham, along with two counts of reckless driving. “We reached that point that the Commonwealth felt we had probable cause to seek an arrest warrant,” Charlottesville Police Chief Timothy Longo said at Tuesday’s 7 p.m. press conference. With this charge, Matthew becomes a suspect, charged with a Class 2 felony of abduction with intent to defile. Police conducted a second search of Matthew’s Albemarle County apartment in Hessian Hills on Monday. Longo said the specific clothing they were looking for was removed from the apartment and “sent to a lab for analysis.” Additionally three bags of evidence were removed. The chief said police are still waiting on certain information and did not detail the results of any forensic testing on evidence taken from Matthew’s car or apartment, as was expected, other than to say they had enough evidence to issue a warrant. I think sometimes media gets it wrong, and the worse thing is, it doesn't get corrected. I think we've all read conflicting information put out by the media. It's sad. It doesn't seem to me things are verified. It's getting the story out first. Although police had talked to Matthew earlier — at his apartment Friday and over the weekend at police headquarters — Longo said police went to the Commonwealth’s attorney with new evidence Tuesday and that the prosecutor agreed there was enough to press charges. Police then obtained an arrest warrant, but Longo declined to discuss what that evidence is. Police focused on Matthew as a suspect after they received tips about his car, a bronze Chrysler coupe, and spotted him in surveillance video with Graham. A witness also said he saw a man fitting Matthew’s description approach Graham as she walked alone, and police said she appeared intoxicated. Matthew has hired an attorney, Charlottesville lawyer James L. Camblos III, who said he met with Matthew on Saturday after Matthew voluntarily went to the Charlottesville police station and briefly spoke with police. Camblos declined to discuss the case or his client when contacted Tuesday night. After the meeting Saturday, Matthew was allowed to leave the police station because police did not have grounds to make an arrest. Longo said early Tuesday that Matthew then drove to an address in nearby Albemarle County, switched cars and then left at a high rate of speed. Matthew evaded a police tail, and officers lost track of him. Police believe he was driving his sister’s 1997 light-blue Nissan Sentra with Virginia license plate VAC4575 and said he has contacts in Maryland, New York, Pennsylvania, Virginia and the District. A man who identified himself as a relative of Matthew’s said over the weekend that he believed Matthew was being “framed” but declined to elaborate. CHARLOTTESVILLE, Va –Investigators took away bags of evidence from the car and home of Jesse Leroy Matthew Jr., now named a suspect in the disappearance of University of Virginia second-year student Hannah Graham. Charlottesville Police Chief Tim Longo was brief and tight lipped during Tuesday night’s news conference, not saying if all lab results were back for the evidence or how it could link Matthew to Hannah Graham. However, Longo says they now have probable cause to charge Matthew with abduction with the intent to defile, meaning they believe he took Hannah against her will to commit a sexual act. Graham was last seen on surveillance camera early Saturday, Sept. 13. Her friends last heard from her around 1:20 a.m. that Saturday, when she sent a text saying she was lost in an area where she could not possibly have been, according to police. Police have said the last person Graham was seen with is Matthew. Surveillance video shows her leaving a restaurant named Tempo off of 5th Street, with Matthew, whom witnesses say bought alcoholic beverages. “We reached that point that the Commonwealth felt we had probable cause to seek an arrest warrant,” Longo said. “Probable cause is a pretty easy burden to meet,” said CBS 6 Legal Analyst Todd Stone, “it doesn’t take much. The public shouldn’t assume investigators have obtained irrefutable forensic DNA evidence to get Matthew convicted on this charge, according to Stone. Stone believes charging Matthew with this felony may be a tactical move to put Matthew behind bars and keep him there during this investigation. Stone explained that having the arrest warrant on just reckless driving charges would’ve allowed for another police department to take Matthew into custody, but they would release him that same day. Additionally, with this new felony charge, if Matthew is picked up in another jurisdiction, he’d have to spend even more time behind bars while he’s waiting to be handed over to authorities in Charlottesville, according to Stone. So, JM's mother was in his sister's car with him when he drove off at a high rate of speed? Where is his mother now? Did he drop her off or what? Is she missing too? What am I missing? Or is this more odd reporting? Matthew has been sought by police since Saturday, shortly after he left the Charlottesville police station, where he had gone to ask to speak with a lawyer, authorities said. Pleasants said that Matthew spoke with a lawyer for roughly an hour and left the station on Saturday, returning to the home of his grandmother. Shortly after, federal authorities, who had been monitoring Matthew’s movements, saw him enter his sister’s vehicle with his mother and drive off at a high rate of speed, driving in a manner authorities said was so “erratic” and “reckless” that they were unable to follow him without endangering themselves and the public. The incident initially resulted in arrest warrants for Matthew, charging him with two counts of reckless driving. He hasn’t been seen since. That's what I've been wondering, if she's still with him or not? If she's not with him, she probably knows where he is imo. Page created in 1.689 seconds with 20 queries.